Apple may be on the verge of expanding the types of devices that can access rich content created using its iBooks Author program, according to a change in wording in iBooks' documentation. Previously, iBooks Author-created ebooks not viewed on an iPad would display a message saying "This book can only be viewed using iBooks 3.0 or later on an iPad. iOS 5.1 or later is required." Now, though, Macworld points out that the text reads "To view this book, you must have an iOS device with iBooks 3.0 or later and iOS 5.1 or later, or a Mac with iBooks 1.0 or later and OS X 10.9 or later." That iBooks will debut on the Mac in the near future is no surprise, given that Apple announced its arrival when showing off OS X Mavericks at this year's Worldwide Developer Conference. 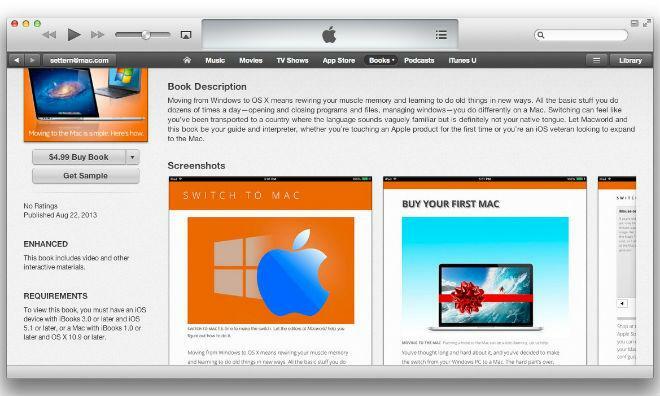 At the time, though, Apple did not specify that iBooks would be expanding beyond iPads on the iOS platform. Allowing iBooks Author-created texts onto the iPhone and iPod would give owners of those devices a number of ebook features they currently cannot access. Among those are embedded videos, interactive content, and the reflowable portrait mode, in which rich elements can float alongside a book's text, resizable and interactive at the whim of the user. iPhones and iPods still cannot download iBooks Author ebooks, but the capability could be unveiled at next week's media event, which will likely see the full unveiling of final versions of Mavericks, iOS 7, and the new iPhone models.